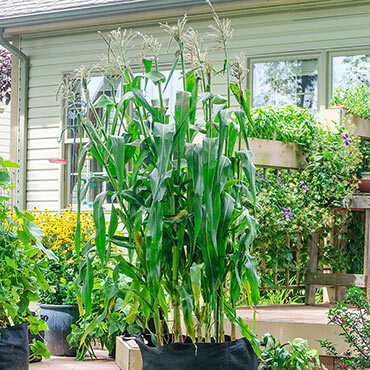 Have you run out of room in your vegetable garden, especially for long, tall stalks of corn? No problem! The strong, short stalks of the Utopia variety of corn make it ideal for container gardening in our unique, versatile Grow Tubs® (we recommend the 20-gallon variety). In fact, this variety was specifically bred to grow best in container gardens! This synergistic, bicolor corn will produce high yields of large, fruity-flavored ears. Use with our Corn Desilking Brush to easily remove those pesky, silky strands before steaming, blanching, or cutting off the kernels to enjoy in salads, stir-fries, and more. The seeds are treated to ensure fast and healthy germination, as well as high yields. Plus, it reduces the need for sprays later on. 77 days to maturity.